Kindbody, a startup that lures millennial women into its pop-up fertility clinics with feminist messaging and attractive branding, has raised a $15 million Series A in a round co-led by RRE Ventures and Perceptive Advisors. The New York-based company was founded last year by Gina Bartasi, a fertility industry vet who previously launched Progyny, a fertility benefit solution for employers, and FertilityAuthority.com, an information platform and social network for people struggling with fertility. 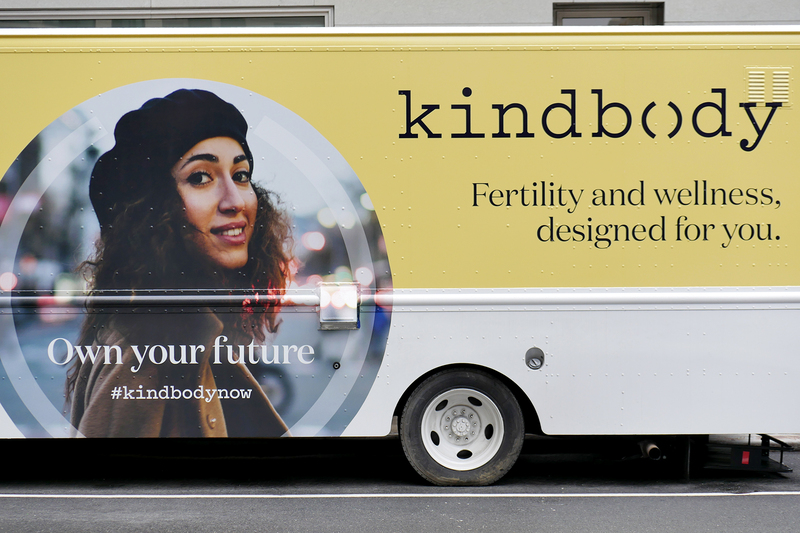 Kindbody operates a fleet of vans — mobile clinics, rather — where women receive a free blood test for the anti-Müllerian hormone (AMH), which helps assess their ovarian egg reserve but cannot conclusively determine a woman’s fertility. Depending on the results of the test, Kindbody advises women to visit its brick-and-mortar clinic in Manhattan, where they can receive a full fertility assessment for $250. Ultimately, the mobile clinics serve as a marketing strategy for Kindbody’s core service: egg freezing. Kindbody charges patients $6,000 per egg-freezing cycle, a price that doesn’t include the cost of necessary medications but is still significantly less than market averages. Bartasi said the mobile clinics have been “wildly popular,” attracting hoards of women to its brick-and-mortar clinic. As a result, Kindbody plans to launch a “fertility bus” this spring, where the company will conduct full fertility assessments, including the test for AMH, a pelvic ultrasound and a full consultation with a fertility specialist. In other words, Kindbody will offer all components of the egg-freezing process on a bus aside from the actual retrieval, which occurs in Kindbody’s lab. The bus will travel around New York City before heading west to San Francisco, where it plans to park on the campuses of large employers, catering to tech employees curious about their fertility. “Our mission at Kindbody is to bring care directly to the patient instead of asking the patient to come to visit us and inconvenience them,” Bartasi said. Kindbody, which has raised $22 million to date from Green D Ventures, Trailmix Ventures, Winklevoss Capital, Chelsea Clinton, Clover Health co-founder Vivek Garipalli and others, also provides women support getting pregnant with in vitro fertilisation (IVF) and intrauterine insemination (IUI). With the latest investment, Kindbody will open a second brick-and-mortar clinic in Manhattan and its first permanent clinic in San Francisco. Additionally, Bartasi says they are in the process of closing an acquisition in Los Angeles that will result in Kindbody’s first permanent clinic in the city. Soon, the company will expand to include mental health, nutrition and gynecological services. In an interview with The Verge last year, Bartasi said she’s taken inspiration from SoulCycle and DryBar, companies whose millennial-focused branding strategies and prolific social media presences have helped them accumulate customers. Kindbody, in that vein, notifies its followers of new pop-up clinics through its Instagram page. In the article, The Verge called Kindbody “the SoulCycle of fertility” and questioned its branding strategy and its claim that egg freezing “freezes time.” After all, there is limited research confirming the efficacy of egg freezing. Though Kindbody touts a mission of providing fertility treatments to the 99 percent, there’s no getting around the sky-high costs of the services, and one might argue that companies like Kindbody are capitalizing off women’s fear of infertility. Providing free AMH tests, which often falsely lead women to believe they aren’t as fertile as they’d hoped, might encourage more women to seek a full-fertility assessment and ultimately, to pay $6,000 to freeze their eggs, when in reality they are just as fertile as the average woman and not the ideal candidate for the difficult and uncomfortable process. Kindbody’s pricing scheme may itself instill fear in incumbent fertility clinics. The startup’s egg-freezing services are much cheaper than market averages; its IVF services, however, are not. Not including the costs of medications necessary to successfully harvest eggs from the ovaries, the average cost of an egg-freezing procedure costs approximately $10,000, compared to Kindbody’s $6,000. Its IVF services are on par with other options in the market, costing $10,000 to $12,000 — not including medications — for one cycle of IVF. Kindbody is able to charge less for egg freezing because they’ve cut out operational inefficiencies, i.e. they are a tech-enabled platform while many fertility clinics around the U.S. are still handing out hoards of paperwork and using fax machines. Bartasi admits, however, that this means Kindbody is making less money per patient than some of these legacy clinics. Bartasi isn’t the only entrepreneur to catch on to the opportunity here, as I’ve noted. A whole bunch of women’s health startups have launched and secured funding recently. Tia, for example, opened a clinic and launched an app that provides health advice and period tracking for women. Extend Fertility, which like Kindbody, helps women preserve their fertility through egg freezing, banked a $15 million round. And a startup called NextGen Jane, which is trying to detect endometriosis with “smart tampons,” announced a $9 million Series A a few weeks ago.